I have a chance for a spontaneous vacation today so I'm grabbing my shawl sample and taking it. 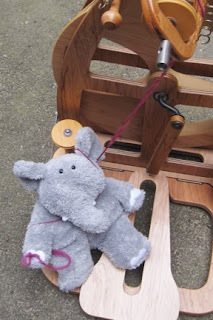 While I'm gone, Hubie wants to try his hand at spinning. This doesn't bode well... but I'm going anyway. Four hours of unfettered knitting, people!